Dupe or not? MakeUP Factory Intense Fuchsia (Mat Wanted) - Cherry Colors - Cosmetics Heaven! When I got my Makeup Factory lipstick in Intense Fuchsia it reminded me of something else.. That made me compare it to a bunch of other lipsticks I already own. And I couldn't believe my eyes when some were a pretty similar match. Which means it's time for another Dupe or Not post. I must admit I quite like these. 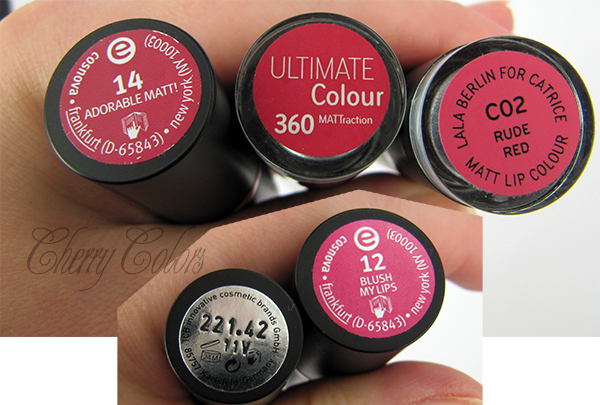 These lipsticks run for about 15€ and I wouldn't be surprised if most people think they are too expensive (they are). Also, this is a limited edition, which means they won't be available once the stand is gone. So read on, to see where you can get a similar shade for less buck. 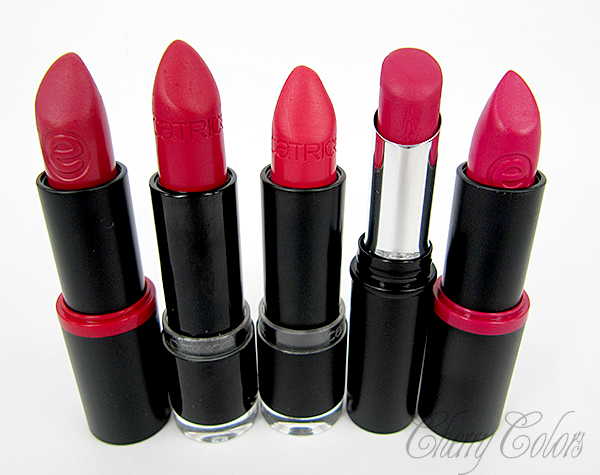 Creamy soft lipstick with a satiny, matt finish and very high covering power. The Mat Lip Stylo is a creamy, soft lipstick with a satiny-matt finish. It distinguishes itself with its lush, intense and long-lasting colour as well as very high covering power. After putting it on, the lips feel supple and pampered without sticking or drying out. The product is free of parabens with dermatologically tested skin friendliness. These are the lippies I have choosen to compare. In the tube they all look quite different or quite similar, depending on the light. On the skin nothing is quite exactly the same shade. Some are pikish, some are lighter, too shiny.. Essence 14 Adorable Matt! (1.70€) This one is a lovely deep red color, with cold undertones. It's not as cold as the others, but it is lovely on me. It is pretty long lasting for a inexpensive lippie, but it doesn't survive drinking or eating. Regular wear is 3h on me. Not a dupe! 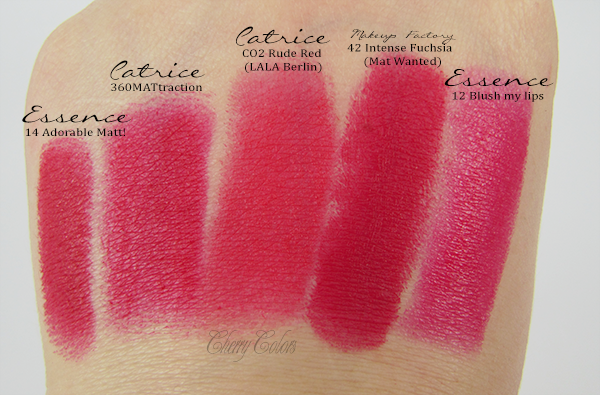 Catrice 360 MATTraction (~5€) This one is one of the closest looking DUPE when it comes to the look on the lips. The application is creamy and smooth. And it's one of my fav lipsticks. I consider it a close dupe, even if it doesn't look similar on the hand swatch. Regular wear is 6h on me. Catrice CO2 Rude Red -Lala Berlin 2015 (6€) This is also one of the pretties colors I own. 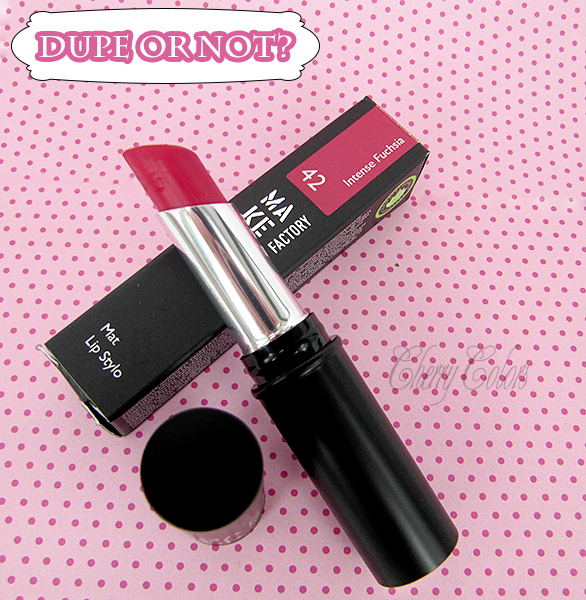 Of course on me it's very similar to Catrice 360 and this means it's a DUPE for MakeUp Factory Intense Fuchsia. Because this is a Limited Edition, it's best to pick the 360 color, which is in the main line. This lipstick has a gentle scent and does survive eating and drinking. Without it, regular wear on me is 6h. Makeup Factory 42 Intense Fuchsia - Mat Wanted (15€) Okay, so this is the expensive lippie. It's a red fuchsia with cold undertones. It looks very dark on my skin, but lighter on my lips. It has a terribly artificial flowery scent. Makes me kind of sick, because it doesn't go away with drinking or eating. Maybe it's a weight loss lipstick *laughs*? It survives eating and heavy drinking. Regular wear on me is about 5-6h. Essence 12 Blush my lips (1.7€) This is a lovely lipstick, and it reminds me of an older Essence lipstick I had when I still wasn't into lipsticks. This is definitely NOT A DUPE. On me it survives for about 3h, no eating or drinking. I think I found the closest dupes, for when I run out of the "main" one. I do also have to apologize for the state of my lips - rubbing off lipstick made them irritated. What do you say? Are those two lippies a dupe or not?